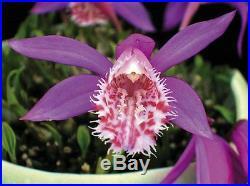 10x Pleione Bulbils You will receive (10) bulbils like in last 3 photos. 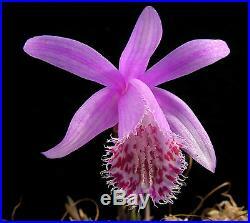 Photos of flowers are for reference of included varieties Description: This pleione orchid mix is for (10) bulbils randomly including any of these rare varieties: Askia, Marion Johnson, Nyiarongo, Fuego, Heckla, Vesuvius, Forestii, Aurita, Humilis, Lemprichtii, Yunnanensis, Stromboli and Santorini and more. Extremely hard to find alba forms also included. Bulbils take a few years to reach flowering size but plant and care just like the flowers bulbs. A great way to get rare varieties at a low cost. Flowers with petals of rich colors, from violet to yellows to whites and mauve. Most of the lips are fringed at the mouth and stained and spotted inside with rich colors. They have amazingly colored blooms which precede the leaf growth. Propagation through division at the end of the growing season. These bulbs are now in their winter dormant phase and will resume growth in the spring. The largest bulbs will be chosen for you. 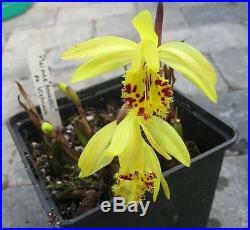 These pleione are already mixed so individual identification is impossible but once the flower blooms you can tell. 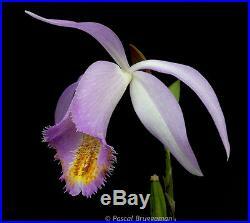 Pleione are terrestrial orchids from China and India. They require free draining media and a distinct cold resting period. Plant in the spring and only repot when the plants are dormant. Plant bulb with 2/3 of the bulb above the media. Keep moist in the summer. When the leaves die off in the fall, remove the bulb from the pot and store in a cool (40 degrees Fahrenheit) until growth starts again in the spring. Note: All of my pleiones are now in their winter rest, bulb form, with no leaves. Great care will be taken to protect the plant as well as the blooms if they have any, but please keep in mind that blooms aren’t guaranteed. Please mind the weather and don’t allow your plant to sit outside for too long, as we can’t be responsible to weather damage (heat or cold). Do not pay until you are finished shopping. If there are any problems then please just’Request and Invoice’ and I will change it manually. Remember to please return feedback after you receive your plants. Please don’t hesitate to contact me with any issues so that we can work to resolve them before issuing feedback. Thank you very much for browsing! 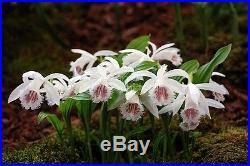 The item “10x Pleione rare bubil mix, Semi-Hardy Deciduous Orchid, Rare Varieties” is in sale since Monday, November 16, 2015. 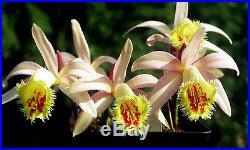 This item is in the category “Home & Garden\Yard, Garden & Outdoor Living\Plants, Seeds & Bulbs\Plants & Seedlings\Orchids”. The seller is “braxtonds85″ and is located in Akron, Ohio. This item can be shipped to United States.